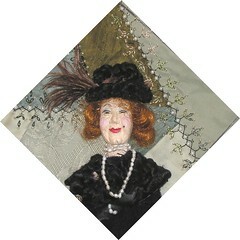 This is a block I worked on for Marya in my Crazy Quilting Internation online cq group. I hand dyed the vintage lace band and the crocheted heart. 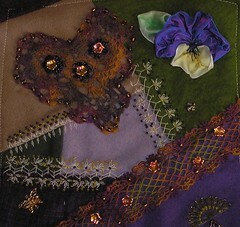 Ithen added a ribbon ruched pansy, a butterfly charm and a metal heart finding that I beaded. I did some seam variations with beads as well. Enjoy! 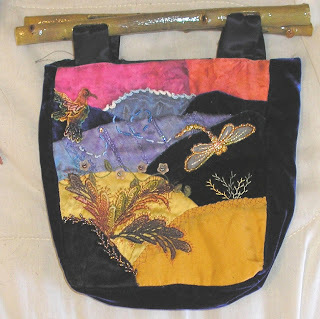 Finally, this is the purse I created for the purse contest at CQI last year! 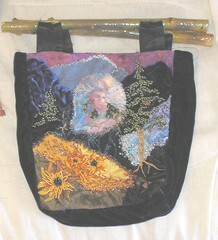 This is the front with a mother earth type silkie and beaded trees and flowers! The back continues with a lighter treatment using lace motifs and embroidery. Now to list it over at Etsy! Enjoy! I have been negligent in getting this posted. 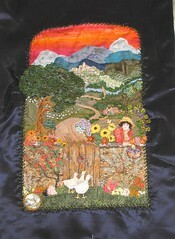 It is a piece that was in a round robin at CQI (Crazy Quilting International). Some awesome work was done on this block! I especially loved Gerry's lady and geese! They are such a wonderful touch! I had to complete it when it got home by adding the tree and a few more touches! Thanks once again to all my cq buddies that helped create an awesome treasure for my wall! This is a completed wall hanging for my vet! He has been wondrful with us and doing things for little to no charge at times which is unheard of today. So, I decided he needed a long lasting reminder of his beautiful furboy, Puck! 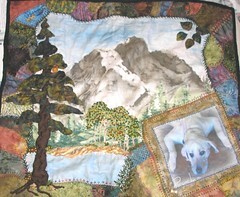 I tried to incorporate the mountains they love and qualities that we find here in Colorado. Hopefully he will enjoy it! This is one of many sets of quilt hangers that my dear husband made. I love these with the carving detail on them! They are made of cherry. 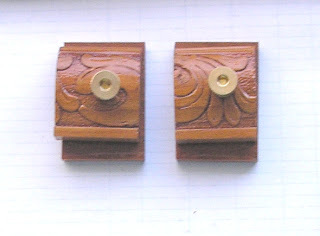 These next ones are made of mahogany and are for larger quilts. I will be soon selling pairs of these on an Etsy shop which i'll direct folks too once its up and going! 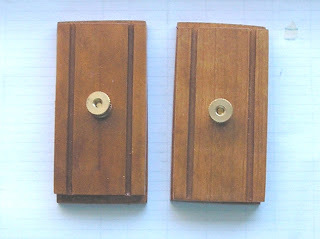 These are WONDERFUL for hanging small pieces and avoids the need for a quilt sleeve! VBG! Enjoy! I am pleased to introduce Star Soprano Singing Sensation, Sadie sporting sable and salt water pearls! LOL!! This is my final contribution to the faces round robin. This is Gerry's fifth lady! I do hope she likes what i've done!